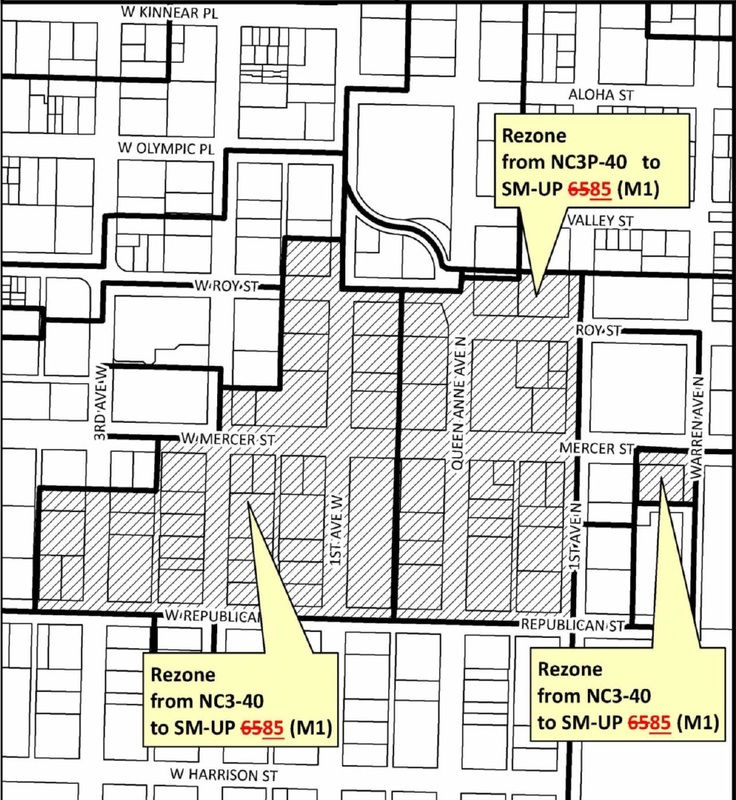 The Council is considering eleven amendments to the Uptown rezone; of which three are controversial. Two of those relate to increasing the maximum allowed height of buildings. 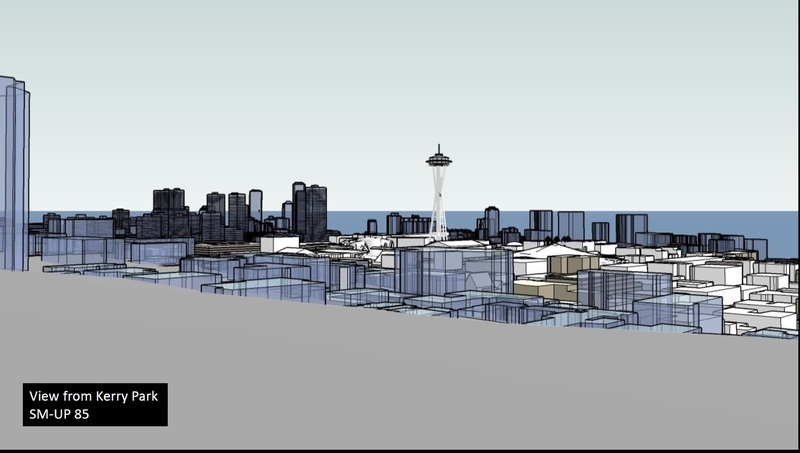 The first, “amendment 1a,” increases heights in the “heart of Uptown” around the intersection of Mercer and Queen Anne. The Mayor’s proposal increases heights from 40′ to 65′; the amendment would push that to 85′. 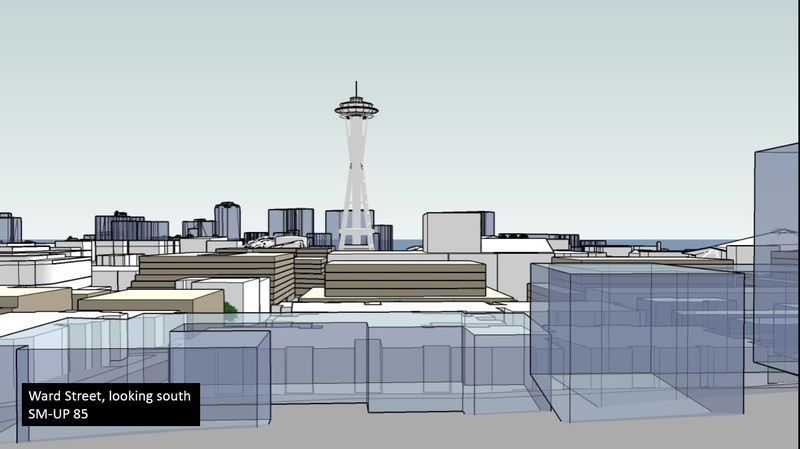 The second, “amendment 1b,” increases heights in the strip of land between Mercer and Roy just north of Seattle Center. The Mayor’s proposal raised the limit from 40′ to 85′. The amendment increases it to 125′. Council member Johnson, who proposed both amendments, justifies them because of the plan to site a light rail station in that area. 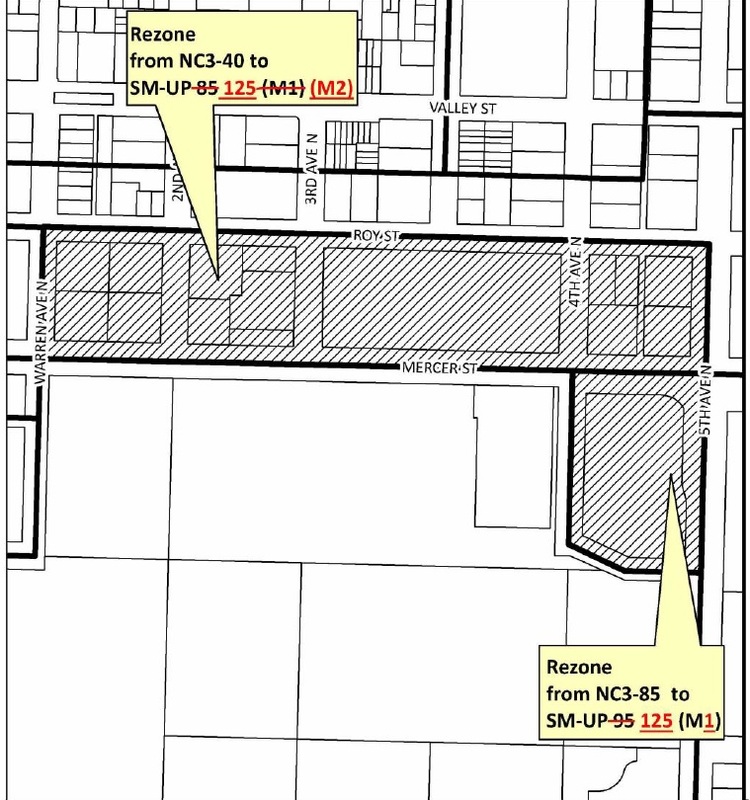 As they have been rezoning the city to activate the MHA program, they have concentrated density around light rail stations, in accordance with the “transit-oriented development” philosophy. But both in the city’s community feedback process while developing the MHA upzone plan, and in public comments at PLUZ committee meetings, many (though not all) Uptown residents have expressed their concerns about the effect that a more aggressive upzone will have on the neighborhood. 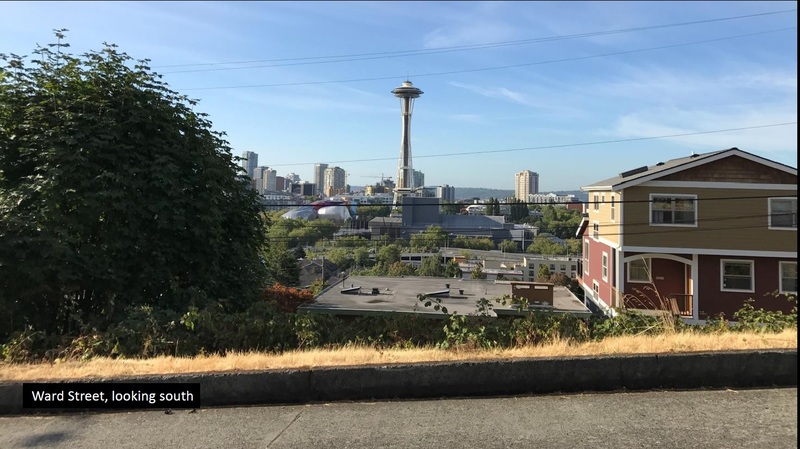 Some are Lower Queen Anne residents eager to maintain their views; others worry that taller buildings will create “urban canyons” that reduce light and air and severely diminish the pedestrian experience. It’s clear that the city staff worked hard to find a decent compromise: adding density without compromising views or the pedestrian experience. The 85′ increase is pretty tolerable; the increase to 125′ has a noticeable effect at street level and along Ward Street (though not so much from farther up the hill). 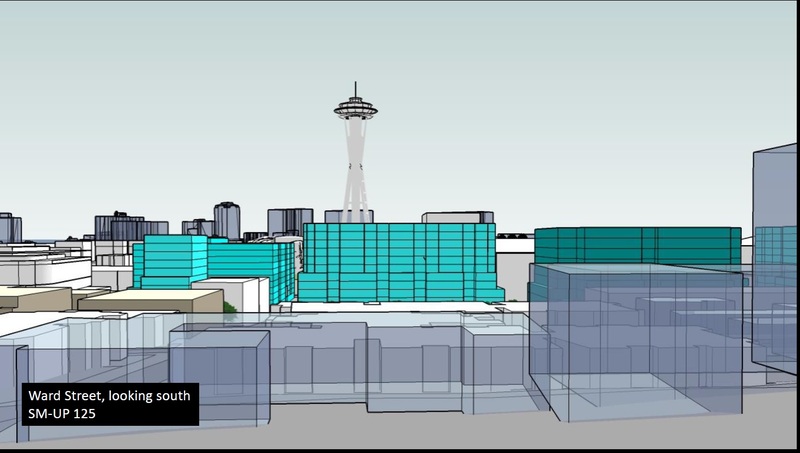 Part of the reason for this is that the land between Mercer and Roy is a natural dip in elevation, so a taller building affects views less; the city staff were clever to exploit this. Nevertheless, the choice between 85′ and 125′ will be a difficult one. Johnson seems to know what he wants, but the other Council members don’t seem sold. 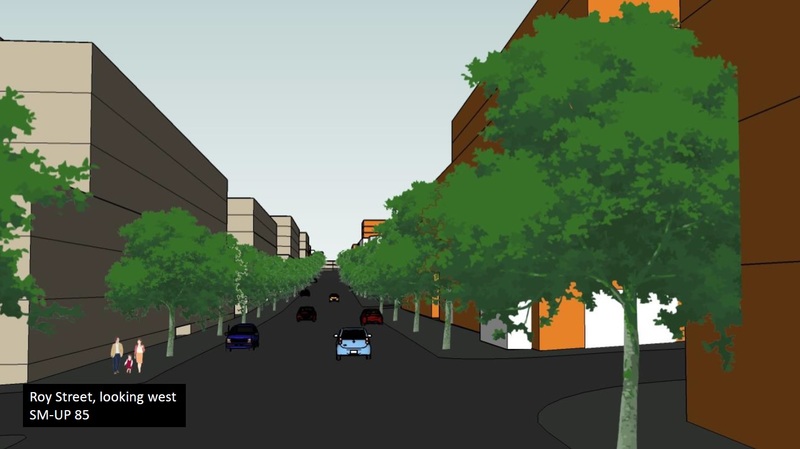 The third controversial amendment (4b) is whether to impose a cap on the number of off-street parking spaces allowed as part of non-residential development. Currently there are none, and the Mayor’s proposal doesn’t add one. However, Johnson has proposed capping it at one per 1000 square feet. That’s the standard used for the Downtown and South Lake Union areas. 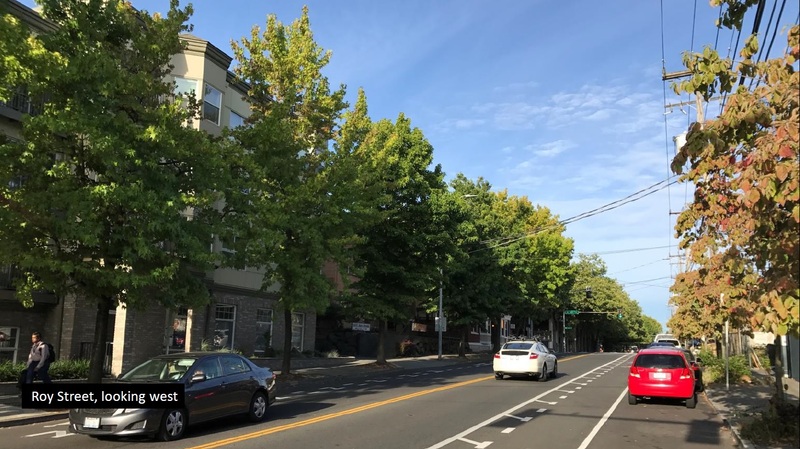 Since it’s a long time before that light rail station arrives, limiting parking in advance might just exacerbate the short-term on-street parking problems in Uptown. Johnson, a true urbanist, never misses an opportunity to get rid of parking; nor does his colleague Council member Mike O’Brien. It’s yet to be seen how other Council members vote though, after community members sound off at the public hearing. 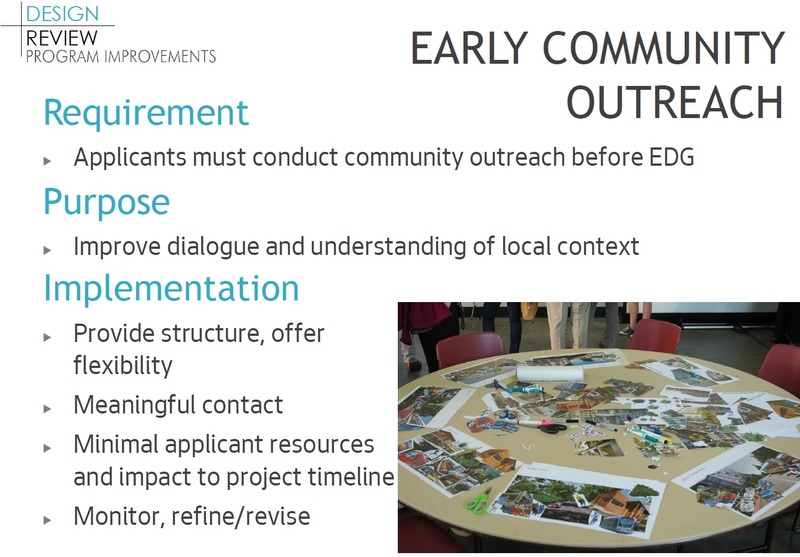 Requiring applicants to do community outreach prior to completing the early design guidance phase, so as to better incorporate feedback from neighbors and provide local context for the project. 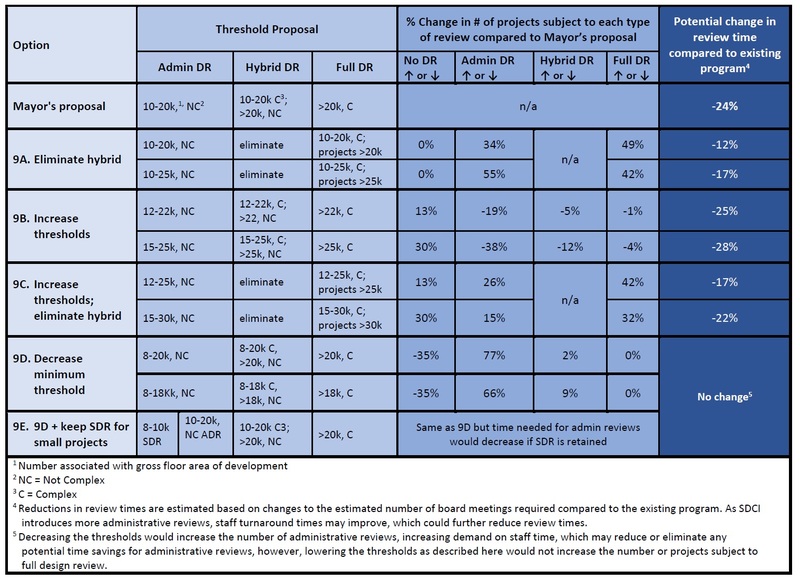 Changing the thresholds that trigger the different types of review process. Changing the different types of review process to try to better match the process with what needs to be reviewed and approved. 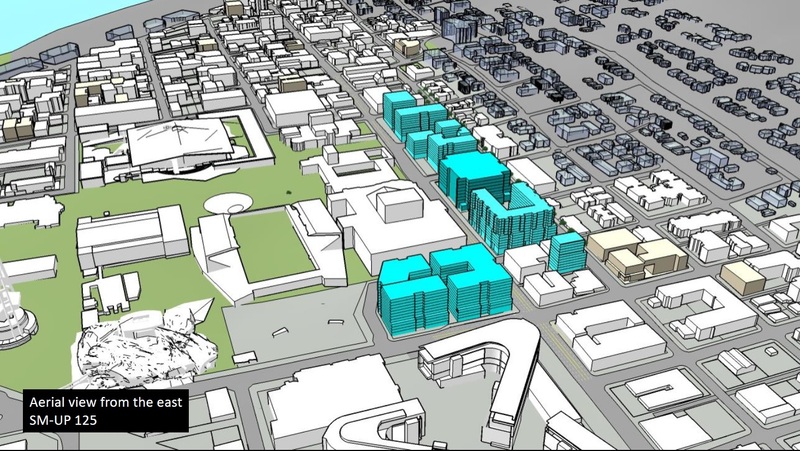 An overarching goal of the effort is to reduce the time it takes for a project to run the gauntlet of design review, so as to accelerate the creation of new housing units in the city. But it’s a difficult balance to strike, because accelerating the process can reduce the amount of input and influence the public has over projects that are approved. (Full) Design Review is a review conducted by 5-member resident design review Boards in public meetings held in neighborhood locations. The process requires two principal phases: Early Design Guidance (EDG) and Design Recommendation. Both phases include a public meeting before the Board. Public notice of the project is provided on the Design Review website, posted placards on site and in a mailed notice to nearby residences. Members of the public may comment in writing or in person at the meetings. City staff provides feedback and guidance to the applicant throughout the process. Design review decisions involving Board review are Type II land use decisions, appealable to the City’s hearing examiner. Administrative Design Review (ADR) is a form of design review that mirrors the steps of (Full) Design Review but is conducted by an SDCI design review planner instead of a Board. It is currently used for certain types of housing projects or when a project is not required to go through design review, but the applicant opts to voluntarily enter the program in order to seek departures from development standards. Public notice of the project is provided thorough mailed notice to nearby residences and on the Program’s website. However, no public meeting is held. Members of the public may comment (to SDCI) in writing during the review process prior to the Director’s decision being published. The SDCI Director’s Decision is a Type II decision, which can be appealed to the hearing examiner. Streamlined Design Review (SDR) is a form of review that was added to the Code in 2010. It primarily applies to townhouse development. SDR is conducted by an SDCI design review planner and has fewer steps and submittal requirements than Administrative or Full Design Review. 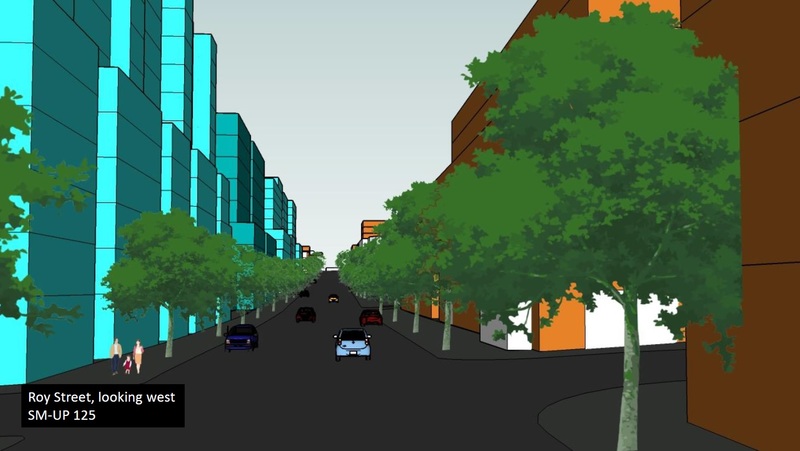 Public notice of the project is provided on the Design Review website and through notice to nearby residences and the public may comment in writing to SDCI. No public meeting is held. The decision of the SDCI Director is a Type I, which is not appealable to the hearing examiner, but to Superior Court. The Mayor’s proposal eliminates Streamlined Design Review, and creates a new “hybrid” review, in which one phase is completed by SDCI staff as with an administrative review, and the other phase is completed by a Review Board. The official plan is for the Early Design Guidance phase to be administrative and the recommendation phase to be by board, but the Mayor also proposes running a “pilot” program where the reverse is true. 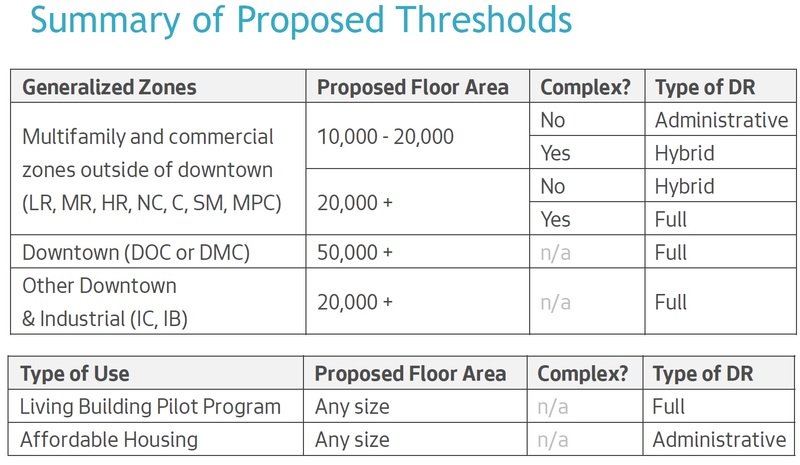 Tied into these changes is the Mayor’s proposal for adjusting the thresholds. There are triggers both for the size of the development, and whether there are aspects that make it “complex” such as requests for variances from existing land use code requirements. It’s not clear, though, that any of these changes actually will speed up the process. The city’s data for 2016 shows that simpler, administratively-handled cases took just as long as larger, more complex full reviews, so simply adjusting the thresholds a bit won’t change much. They also have some other ideas for streamlining the process, such as granting Special Review District and Landmark Review boards the ability to approve some departures from land use codes, so that project don’t need to also gain approval from a Design Review Board. On the other hand, Council members are also thinking about doing the opposite: lowering the thresholds so that more projects are subject to design review. That has the benefit of giving the public more opportunity to weigh in on projects, but it will obviously slow down construction. They are looking at doing it across the board, but they are also looking at lowering the thresholds specifically for “areas in transition” that are being rezoned from single-family residential to “lowrise 3” or higher for the first five years after the zoning change; their hope is that this will place more attention on ensuring that these neighborhood transitional areas are handled with care. Strangely, the Council doesn’t seem to be asking the one obvious question: would adding more staff to SDCI make the review process go faster? Changing the thresholds, or some of the parameters of the review process, is nibbling around the edges. 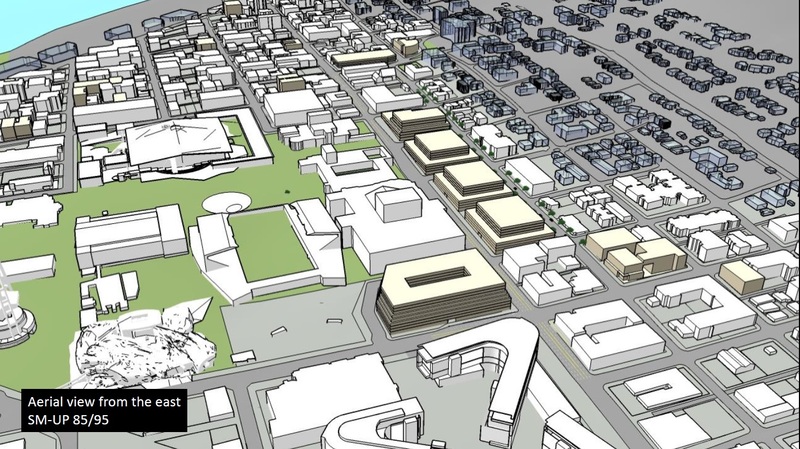 The city has a commitment to providing the public a chance to hear about and influence project designs through the Design Review process, so there will always be a substantial amount of work to do. But if the delay is with the overworked staff, the best way to speed things up may simply be to staff up the department — at least until the construction boom ends. Nevertheless, tonight the Council is looking for input from the public on which way they should proceed: expedite the design review process possibly at the cost of less public input, or provide the public, nervous over the zoning changes happening across the city, with more opportunities to weigh in on project designs even if potentially slows down construction. Both options are on the table, and the Council seems to be reserving judgment until after tonight’s hearing. The next meeting of the PLUZ committee is scheduled for September 19th, when both of these topic will be revisited and discussed. Tonight’s hearing begins at 5:30pm, and is being held at SIFF Cinema Uptown, 511 Queen Anne Avenue North. Word on the street is that popcorn will be served. Thank you, that is indeed an obvious question and you’re not the only one asking. I’m told there’s a waiting list of volunteers to staff more board meetings, and the bottleneck is only DCI staffing.